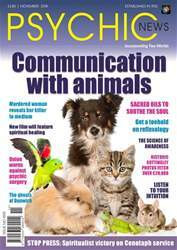 In the November issue of Psychic News, animal communicator Pea Horsley gives an in-depth interview on how to communicate with the animal kingdom. Film producer Dena Barnett takes us behind the scenes of her new film on spiritual healing. Barbara White investigates how intuition can enhance your life, following Oprah Winfrey’s advice to listen to your gut feeling. Medium Petrene Soames shares some fascinating evidence of how a murdered woman revealed her killer to her. John West visits the area of the Suffolk coast’s very own Atlantis – the sunken village of Dunwich – and finds that some etheric people still wander what remains. We report on the recent sale of the famous Cottingley Fairy photographs. Billy Roberts discusses the science of awareness, and Felicity Warner writes about sacred oils to soothe the soul, and shares their uses and history. 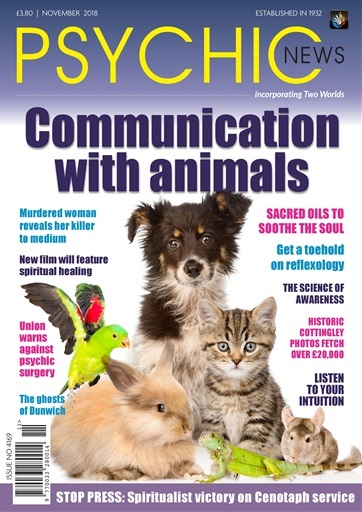 In the news we have: Union issues directive on psychic surgery in its churches; the Duchess of York’s friendship with a clairvoyant; psychic says Roman soldiers cause accident black spot on crash-plagued M6; report on the One World, One Spirit event in Birmingham; and the ground-breaking news that, for the first time ever, Spiritualism will be represented at the annual Cenotaph ceremony.